Many young Nigerians have been elated since arrival of the news that President Buhari signed into law on May, 31, 2018; what has now been popularly recognized as the #NotToYoungToRunBill. The significant effect of this new law is that it reduces the age requirement for persons who wish to contest for political office thereby giving young Nigerians the opportunity to show they are not too young to serve and help grow Nigeria either. Special kudos should also be given to the Bukola Saraki led National Assembly for also ensuing the law was passed into barely a year after it was introduced. However, many have asked how this law will come to be effected as it contradicts the provisions of the constitution which provides for the minimum limit of statutory age requirement for persons who wish to contest political office. 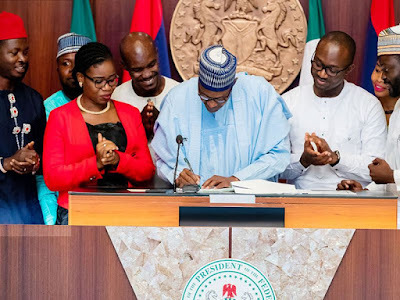 At this point, it is important to note that the new law signed by President Buhari does not in any way conflict with the constitution as the Bill itself was a Bill to amend the Nigerian Constitution as the title of the Bill reads - A BILL FOR AN ACT TO ALTER THE PROVISION OF THE CONSTITUTION OF THE FEDERAL REPUBLIC OF NIGERIA, 1999 AND FOR OTHER MATTERS CONNECTED THEREWITH. (b) the House of Representatives, if he is a citizen of Nigeria and has attained the age of twenty-five years. It should however be noted that some of other aspects of the Bill were however not signed into the amendment. For instance, the age requirement for a member of the Senate was retained at 35 years as well as those of the Governors. Though, the initial contained a provision to reduce both requirements to 30 years.